I was going to call this recipe “must love garlic” because there’s a whole lot of garlic going on in this dish. Spaghetti aglio e olio (spaghetti with garlic and oil) is a quick and easy dish to put together and it’s extremely flavorful. 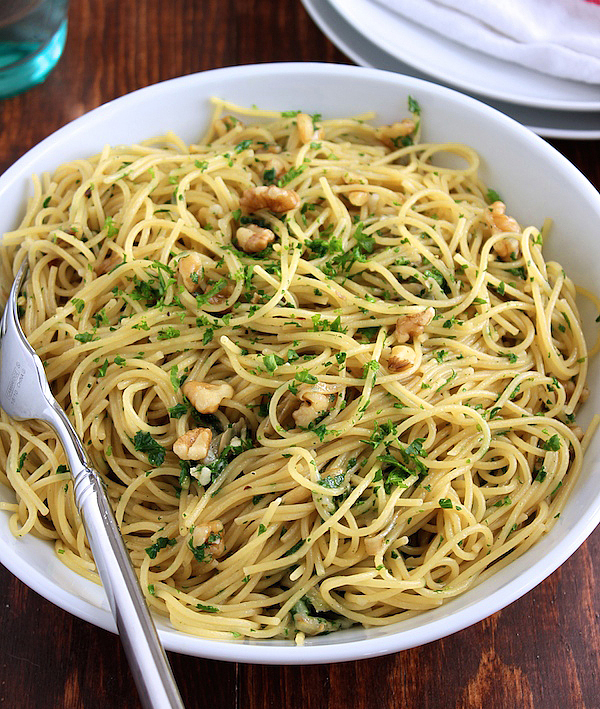 Spaghetti aglio e olio is also sometimes called midnight pasta. The saying goes that this is the dish that chefs make for themselves when they come home from a long day of work. I can see why they’d make it, it’s very satisfying to be able to whip something up quickly that tastes so good. This is a go to dish – one that’s easy to master and you’ll make over and over – whether it’s midnight or not. I was going to say bon appetite but realized that would be inappropriate since this is an italian dish so buon appetito! This dish comes together really fast so have everything prepped and ready to add before you begin. This recipe is very flavorful because, at the end, you cook the pasta for a few minutes in a cup of veggie stock. After you’ve cooked the pasta for half the amount of time listed on the pasta box, you drain the pasta and then add it and the veggie stock back into the pasta pot. You’ll cook the pasta and veggie stock on high, stirring often until most of the stock has been absorbed by the pasta. Though not traditional, I’ve added some walnuts to the recipe for crunch. You can leave them out if you want but I think they are a great addition. I added the parmesan and parsley in two separate passes. If you add it all at once it tends to form a big cheesy lump rather than coat the spaghetti. So sprinkle half of the parmesan and parsley over the spaghetti and, after stirring, add the remaining half of parmesan and parsley. This recipe is adapted from a Silver Palate recipe “spaghetti with oil and garlic”. I can’t link to the recipe since it’s from an old cookbook – but I love that cookbook and refer to it often. A quick, easy pasta recipe that’s extremely flavorful. Dash of red pepper flakes – use as much or as little as you like. 1 cup of stock – I used 1 cup of pasta water with a veggie bouillon cube added. Thinly slice 4 cloves of garlic and set aside. Mince or put through a press 2 cloves of garlic and set aside. In a small sauce pan heat olive oil over medium heat. Add sliced garlic cloves, red pepper flakes and black pepper. Swirl over heat for 1 minute until garlic becomes slightly brown. Watch the garlic closely – you do not want to burn the garlic – it should be a very light brown color. Remove from heat and set aside. Add spaghetti to large pot of boiling water. Cook the pasta for half the recommended time. My pasta box said 6 minutes until ‘al dente” so I set the timer for 3 minutes. After 3 minutes, drain the pasta. Add 1 cup of veggie stock into the pasta pan, turn heat to high, add in pasta. Cook stirring frequently for the remaining 3 minutes. The spaghetti will absorb the stock. Remove from heat. Pour the olive oil and cooked garlic mixture from the small saucepan onto the spaghetti and toss. Add minced raw garlic and toss. Add half the parmesan cheese and half the parsley by sprinkling it over the pasta and toss. Add the rest of the parmesan cheese and the remaining parsley and toss. Reserve a little parsley to sprinkle on top of the pasta at the end. Add walnuts and toss to combine. 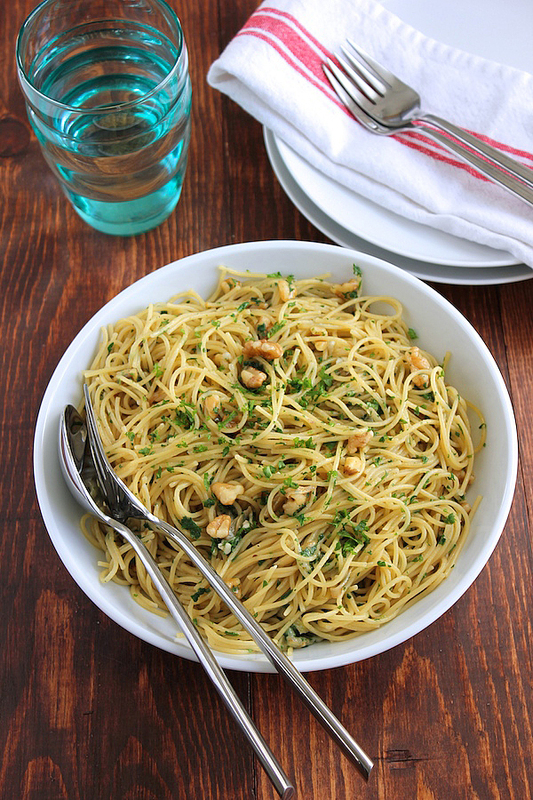 Transfer spaghetti to a serving dish and sprinkle with a little parsley before serving. Would you provide nutrition info for your dishes? Calories, carbs and sodium? Hi Sharie – Sorry, I don’t have the resources to provide nutritional information. Glad you like the recipes though. Thanks for stopping by and have a great weekend. YUM. this looks delicious! love a good spaghetti dish and this one i definitely will be trying. 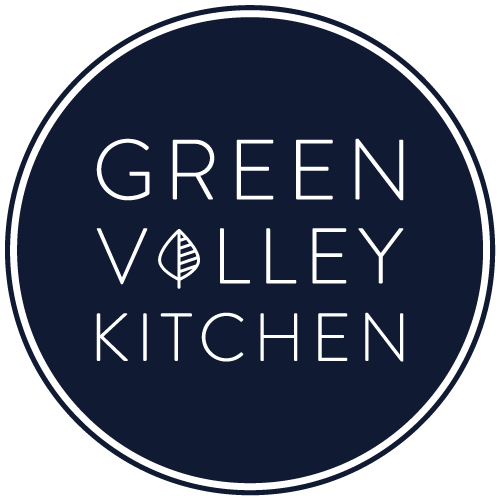 thanks for the awesome recipe geraldine! Thanks so much, Thalia. Hope you enjoy it! I love the addition of the walnuts! Theres nothing like adding a bit of texture to the creaminess of pasta. What I love most about this dish is that it takes 17 minutes to pull together! WHA….?? Looking forward to trying this! Thank you, Geraldine! Hi Traci – I’m all for fast pasta recipes – anything under 30 or even 20 minutes is my goal – especially in the summer. I think you’ll really like this one! Have a great day. Love this dish! It’s one of my favorite comfort foods. Your addition of walnuts is a fantastic idea! Hi Marie, thanks for stopping by and commenting! Have a great day.